Stampin' Up! UK Demonstrator - Teri Pocock: New Product Blog Hop!!!! 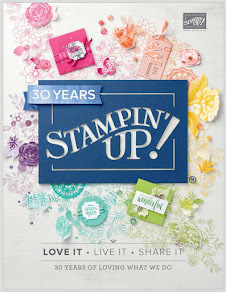 Last month saw the release of 11 new products from Stampin' Up! The cardstock and ink pads will be available in the new catalogue coming in October, but the papers, ribbon and window sheets are only available until the end of September or while stocks last! Over at In Love With Stamping the Stampin' Up! Demos decided to have another blog hop to welcome these new products and colours! There are 3 loops of blogs - each containing 15/16 blogs! So we hope to offer you lots and lots of inspirational ideas of what you can do with these new products! The 3 loops each start off at the wonderfully talented Debbi's blog. I'm the last blog on round 2, so once you've had a looksie, pop back to Debbi and start round 3! This first project is a design by Lynda Moss a very talented Australian Demo. It's a box which opens out like a book and I've made 4 cards to go inside using the beautiful Live Your Dream stamp set. I have used Old Olive, Rich Razzleberry and Orchid Opulence cardstock and inks, together with the gorgeous Cottage Wall Designer papers and Rich Razzleberry Dotty Grosgrain ribbon. This shadow box card uses Soft Suede, Rich Razzleberry and Melon Mambo cardstock and inks, the Cottage Wall DSP and the gorgeous Flower Fantasy Window Sheets .... as well as a little Dazzling Diamonds for a bit of bling! 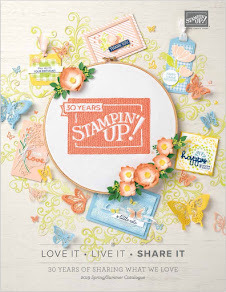 :o) The stamp sets used here are Pocket Silhouettes and the Level 2 Hostess set - Whimsical Wings. My final offering is two Father's Day cards. Very simple, using the Lovely as a Tree stamp set. The cardstock and ink is Soft Suede. I have teamed them with Barely Banana for one card and Close To Cocoa for the other. Both use the lovely Soft Suede Dotty Grosgrain ribbon. Gorgeous proejcts - will have to brayer my night and day dsp now! great projects - I really have to get my brayer out! I love your boxed set of cards really stunning. oooh love the box idea. Really great! Oh wow Teri, you have been sooo busy! Absolutely stunning creations, love them all! Wow, these are stunning...such beautiful colour combos. Gorgeous projects especially the shadow box card! Great projects, love the Fathers Day ones! Wow - you have been busy Teri. All just gorgeous as usual. I just can't pick a favourite cos I love them all. I can see some serious casing coming on here, lol. I love all of these. Totally gorgeous! These are so beautiful- love the box at the top- really gorgeous! Your shadow box card is just wonderful! Love it! Stunning projects Teri, I love them all. Stunning cards and I love the box idea to put them in, what a beautiful gift for someone. Great projects. Love them all! Wow Teri, You've been busy and Creating truly spectacular projects. I wouldn't know where to start. So I'll say well done on it all. especially the tid bit about brayering the night and day paper. what an awesome idea that was. You rule!! A whole lot of inspiration on this blog post. You've created a great group of stunning items. Christmas In July - All Day Crafting Event!! !